If you don't cook outside this summer, you're not doing it right. From where you can (and can't) grill in the city to recipes that are sure to delight your friends and family, we've got you covered. 1. Barbecuing is allowed in designated areas only. 2. No barbecuing permitted under trees. 3. All coals and litter must be disposed in trash receptacles. Find a park near you on the NYC Parks website. At Central Park, grilling is only permitted three days of the year: Memorial Day, the Fourth of July and Labor Day and grillers are "encouraged" to go above 96th St., where it's "less crowded." Meat. A variety is best. For ease, we like hot dogs and sausages, and maybe a nice (thin) skirt or hanger steak, but feel free to mix it up. Remember: Burgers are delicate and can get smushed during transport. Chicken takes longer to cook than other things you'd grill. And don't forget the vegetarians: Tofu dogs are not great, but someone will thank you. Buns. Bring one bun for every dog, sausage or burger patty. Condiments. Another reason we like dogs and steak, burgers are better with condiments. You need ketchup, mustard and mayo, at the very least. Paper products: Plates and napkins are a must. Try and buy recycled. Snacks. All you really need are chips, pretzels and fruit. Our fave: watermelon slices. Cut them at home and bring in a reusable container. Side dishes. While a lot of people will opt to not bother with sides, we think they are an important part of any barbecue and you should go the extra mile to bring something. Keep it simple: Whip up a diced-vegetable, potato or macaroni salad at home and it's all ready to go. Rice and beans is another simple dish. Or bring chopped up veggies for grilling -- we like zucchini, eggplant, peppers and mushrooms. Just remember to marinate them first so they don't dry out on the grill. Reminder: Alcohol is prohibited in all city parks. Other items: Bluetooth or portable radio, blankets, chairs, games (for the young and the young at heart). New Yorkers are industrious, and they take advantage of any space they can. But there are some rules that you may want to pay attention to when it comes to grilling. The first is either abide by the rules, or use your best judgment and be prepared to pay the consequences. You can't grill on fire escapes, according to the city, and you can't grill anywhere that's within 10 feet of a building. The FDNY has more on fire safety rules. Charcoal grills can be used on a terrace or in a backyard but not on a balcony or roof, according to the code. There must be a 10-foot clearance between the grill and the building and you must have access to a fire extinguisher or water supply. 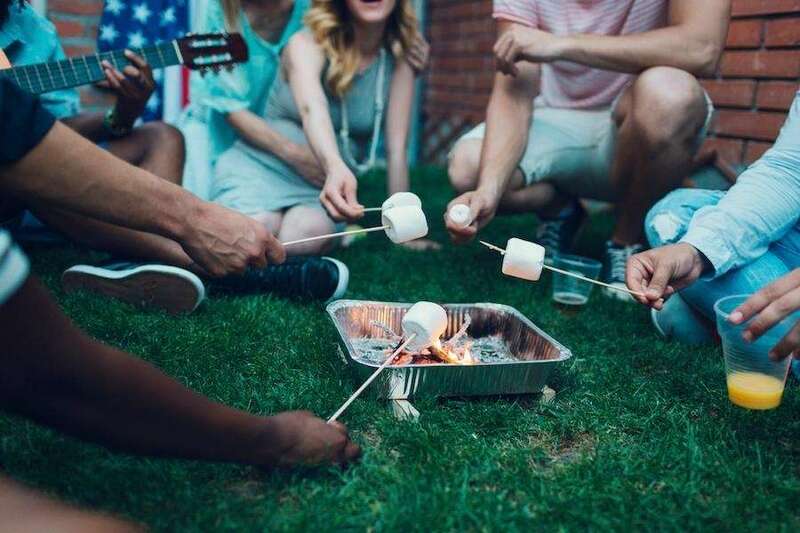 Propane tanks can be used to fuel gas grills in the outdoor space of an apartment building (roof, patio, courtyard), but they must be smaller than 16.4 ounces and cannot be stored. The 10-foot clearance rule also applies here. Something else to note: flammable items and surfaces. Don't grill on a tar-covered roof, or else you're asking for trouble. You want your coals on fire, and nothing else! Grilling inside is not only possible, it's easy. You just need a few things, and to believe in yourself. First things first: Invest in a grill pan. They come in all sizes, but make sure you get one with the interior ridges. We love the All-Clad version but any grill pan at any size will work. Your food will have grill marks and will cook like it does on a grill, with the fat dripping away from the meat. Next, make sure your smoke detector and oven fan are in working order. Things will (and should) get smoky. Tip: To keep smoke levels down, don't overdo it with sauce and oil. And don't press the foods so that fat drips out. It will burn off and dry your food out more quickly. Add smoke flavor. If you're grilling inside over a gas burner, there won't be any smoke from charcoal or wood chips to flavor your food. So why not try some added smoke flavor? You can achieve this by using a smoky finishing salt on a steak, or a smoky rub as a marinade on chicken or pork. This is where the fun really begins. Get creative with those side dishes! No. 1 rule for a grill-out: Have fun! Because there's nothing better than grilling out with your friends and family.